- Better support : Double chest support and adjustable belt with lumbar support. - More efficient : Double lateral support with quick lock. Adjustment of support straps is independent : passenger and pilot. - Quality non-slip seat : bi-component neoprene with special surface for pilot. « X » system of straps for high resistance and optimal support. In accordance with the recommendations regarding retention devices on motorbikes these devices inactivate naturally should the rider fall from his or her machine. 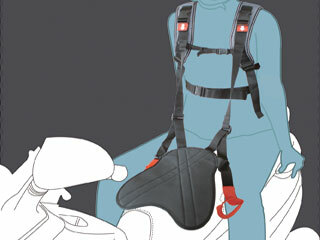 SIT System®: The device consists of a harness type means of retention connected to the system for maintaining the passenger on the pillion seat. The retention device is a leaf made of a non-slip material and positioned without fixation on the rider’s part of the saddle. It is the weight of the rider that maintains the leaf in position. So sandwiched the leaf is immobilized. It is sufficient anchorage, according to the weight difference between the rider and his or her passenger, on which the maintenance of the pillion passenger depends. The device does not constitute Personal Protective Equipment (PPE) nor does it constitute a retention device as defined in the guidelines and regulations in the EEC. Using this device does not excuse users from compliance with regulations, codes and texts in force in the EEC and in any country where the transportation of passengers on motorcycles is approved. The company Veector cannot be held responsible for non-compliance with these obligations by users.